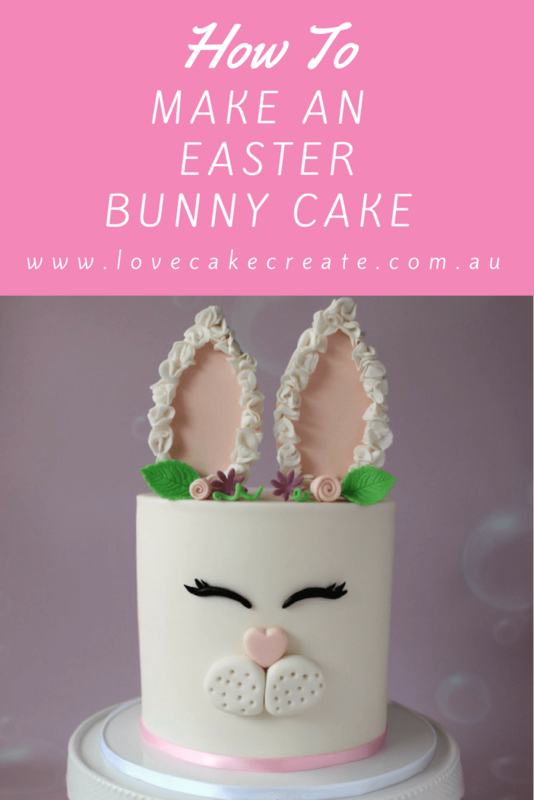 If you’d love to learn how to make an Easter Bunny cake perfect for your Easter celebrations, then you’re in luck! 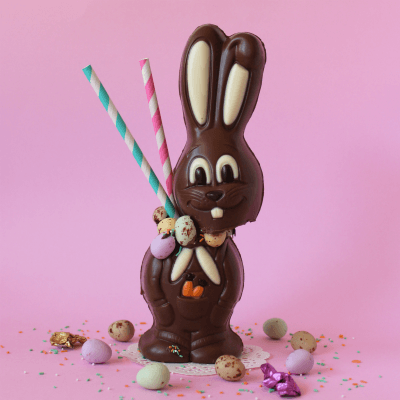 This adorable bunny is sure to add an element of fun and sweetness to your party. Easter is just around the corner and I’m excited to bring you my first Easter cake tutorial. This bunny cake is inspired by the unicorn trend that’s still going strong (with no end in sight!). With tall fluffy ears and a cute little face, this bunny is sure to be the star of the show at your Easter party. My two boys were really excited to see this cake come to life and couldn’t wait to get their hands on it! 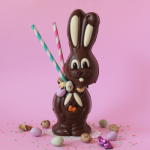 If you’re looking for another fun idea for Easter, check out my Easter Bunny Milkshake tutorial – this one gets a big thumbs up from the kids too! 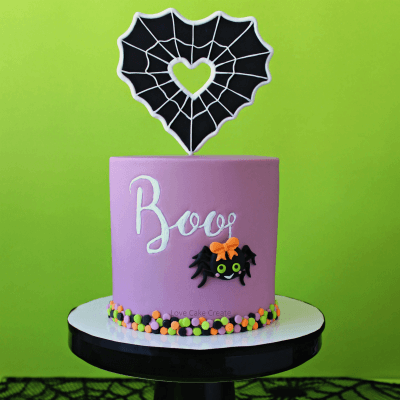 The design of this cake is nice and easy, so even if you’re a beginner you’ll be able to follow along with this step by step tutorial. 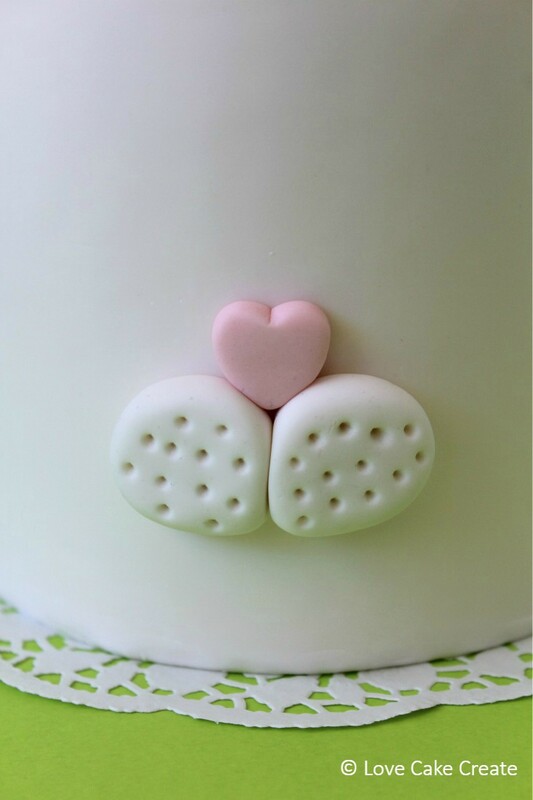 1 x 5″ round x 5″ high cake (or the size of your choice) covered in white fondant. We’ll start of with the bunny ears since they need a little drying time. You can skip this first part if you already have a cutter in the shape of bunny ears. Since I don’t have a cutter, I’m going to make a template and cut them out with the exacto knife. If you enter “Easter Bunny Ears Template” into Google, a wide variety of long, short and floppy ears pop up. Choose the ears you like best and save the picture to your desktop. When you open the picture, you can zoom in and lightly trace the ears onto your baking paper. 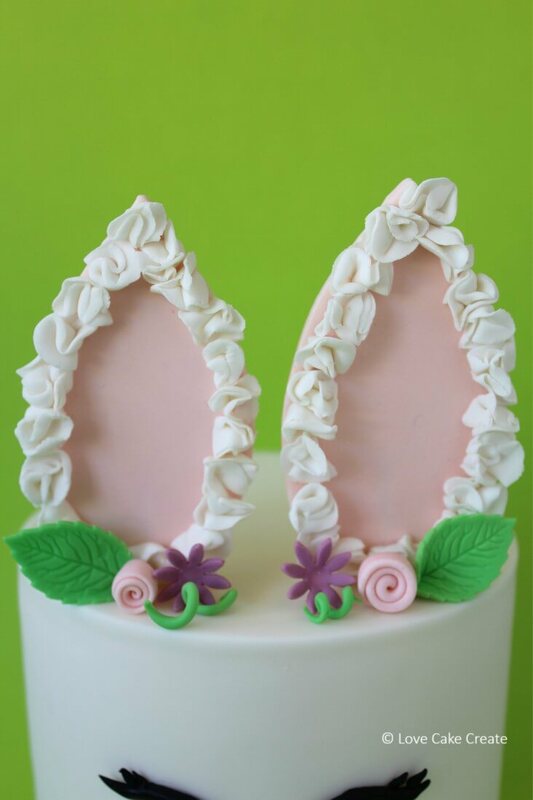 Decide how tall you would like your bunny ears – for this 5″ cake, my ears are 9cm tall. Flip the paper over and re-trace the ears on the other side of the baking paper (so the pencil outline is on the front and back of the paper). Flip it back over to the front and pop the baking paper on top of the cardboard. Re-trace over the ear outline and the pencil on the back of the baking paper will now transfer onto the cardboard. Use your pencil to trace over the outline and then cut out your ears template. To help ensure the ears set firmly, add approx. 1/4 teaspoon of tylose to the pale pink fondant and mix it in well. Roll out the fondant to approx. 6mm thickness – it needs to be slightly thicker than the toothpick. Place the cardboard ears on top of the pink fondant and use your exacto knife/sharp knife to cut around the ears. Add a dab of sugar glue to the end of a toothpick and insert it in the bottom of the ear – approx. 1/4 to 1/2 up the toothpick will be fine. When you’re inserting it, place your thumb on the front of the ear and your index finger on the back of the ear; that way you can feel as the toothpick is being inserted and make sure it doesn’t break through the fondant. Once it’s inserted, lay it down flat and use your finger to smooth over any bumps on the front. Repeat the process for the other ear. Pop the ears aside to dry overnight (I flipped mine over after a few hours so it dried on the front and back). Once the ears have dried, it’s time to add the fluffy white ruffles around the outside. I was tossing up whether to just leave them pink or use royal icing to line the outside, but I wanted something with texture so the white scrunch ruffles were effective. 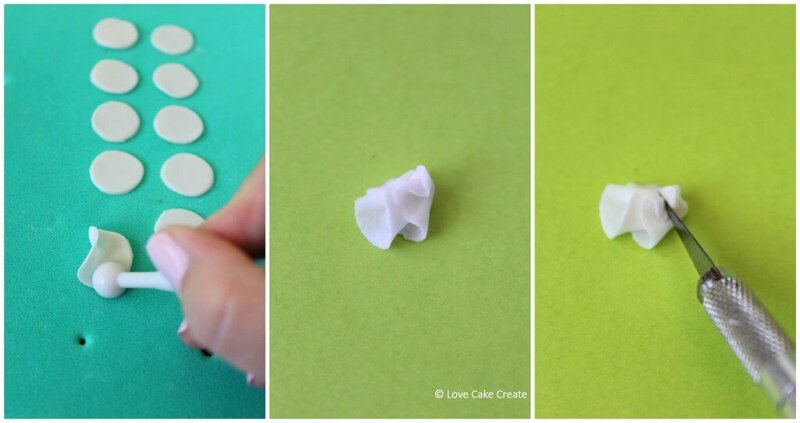 Use the small circle cutter to cut out lots of circles and pop them on the foam pad. Place the balling tool half on the mat, half on the edge of the circle. Apply a firm pressure (but not so much that it tears the fondant) and start to move the balling tool around the rim of the circle. The edges should start to thin out and frill up. 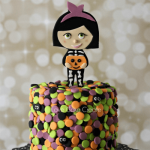 This works best when your fondant is rolled nice and thin. Take the frilled circle and scrunch it up a little – position the thinned, frilled edges towards the top. Use the scalpel to remove a small section from the back and smooth it over with your finger. It helps to have that bit flat so when it comes time to attach it to the cake, it sits properly. Continue making circle ruffles until you have enough for both ears. To attach them, add a little sugar glue to the back of each ruffle and adhere them to the ears. First take some green fondant and roll two tiny thin sausages approx. 4 – 5cm long. Taper the ends so they come to a point. 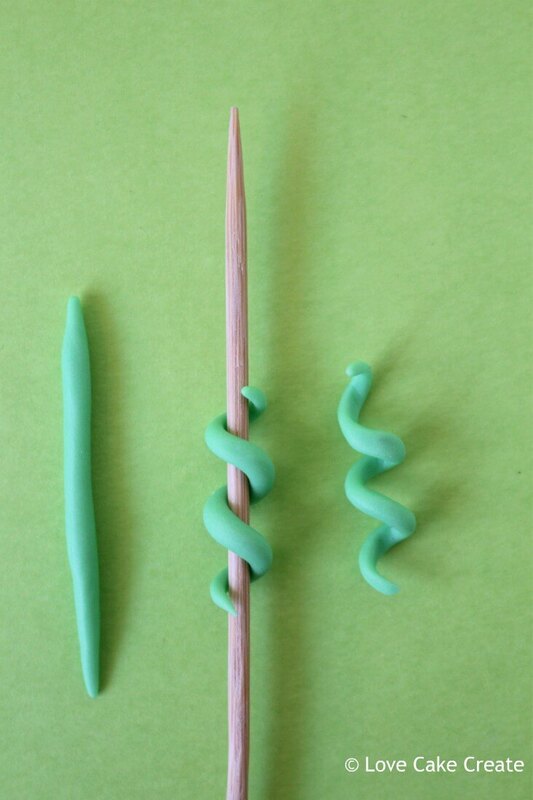 Roll the green sausage around the bamboo skewer and leave it to firm up for a minute or so. Gently remove it from the skewer, ensuring it keeps the shape of the spiral vine. Pop them aside to dry. 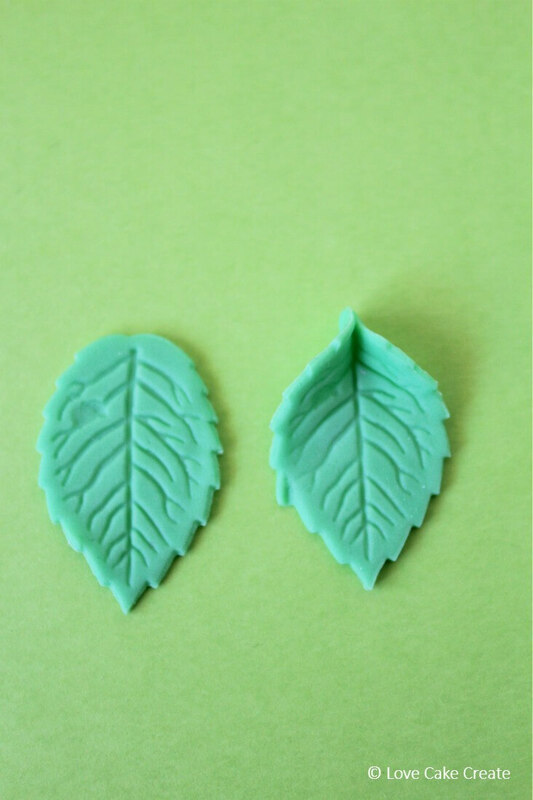 For the leaves, roll a small amount of green fondant and use the leaf plunger to cut out two leaves. Pinch one end of the leaf. Pop them aside. 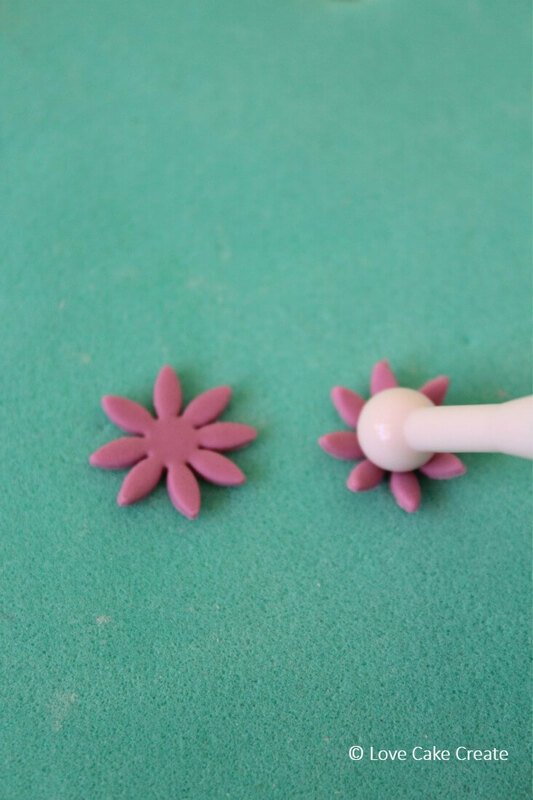 Roll out a small amount of purple fondant and use the daisy plunger to cut out 2 daisies. Pop them on the foam pad and use the balling tool to add pressure to the middle of the daisy. Once pressure is applied, the petals should start to curl upwards. Pop them aside to dry. 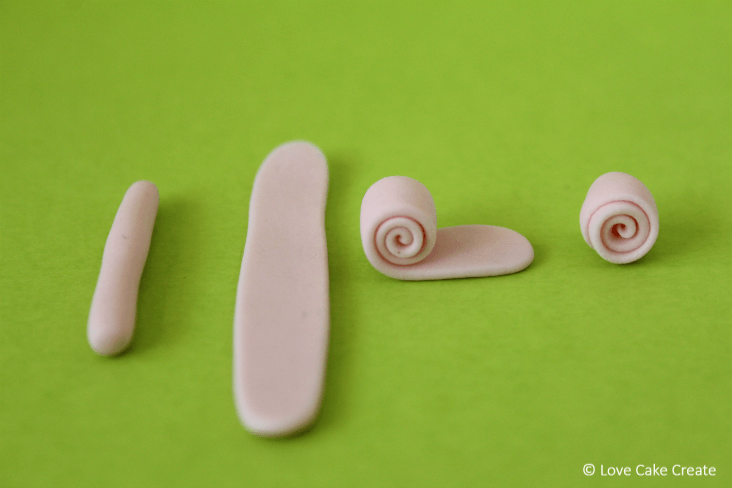 For the ribbon flower bud, take a small amount of pale pink fondant and roll it into a short sausage. Use the rolling pin to flatten it slightly. Add a little sugar glue lengthways, across the middle. Take one end and roll it up, rolling towards the other end. The sugar glue will help ensure it stays in place. 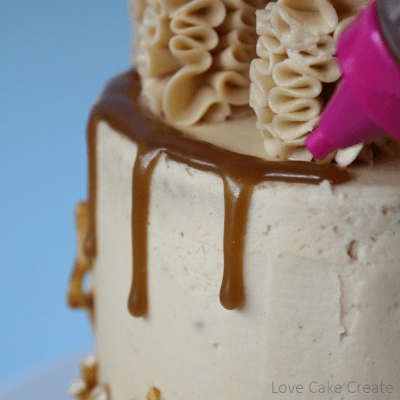 Use the exacto knife/sharp knife to remove a small amount from the back; this will help it sit properly on the cake. Now we can move on to the bunny nose and mouth. Roll two balls of white fondant and place them side by side. Use your finger to push down on the balls to flatten them and make them into a bunny mouth shape. Leave a little V at the top which is where the bottom of the heart nose will sit. Take the cone tool and make indentations which will represent the bunny whiskers. Next roll out some pale pink fondant and use the heart plunger to cut out a heart for the nose. Use your finger to smooth over the cut edges. 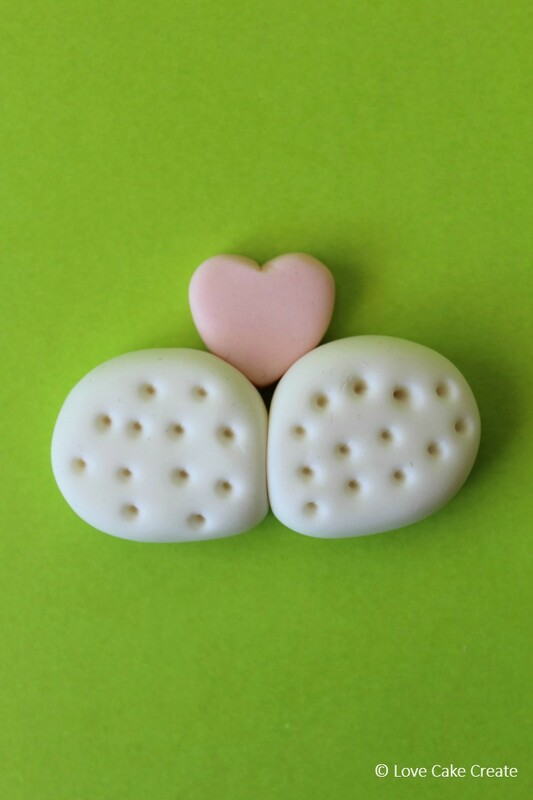 Position the heart at the top of the bunny mouth to ensure it’s a snug fit. For the eyes, I made a template which would give me the curve and length I needed for this size cake. You can just freestyle your eyes if you like. If you type “unicorn eye template” into goggle, lots of fun lashes will appear. Choose the design you like and trace it onto baking paper. Roll two small sausages of black fondant and taper both ends so they come to a point. 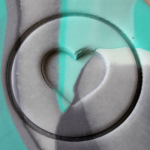 Position them on top of the template and move them into an arc shape that flicks out on the outer edge. Roll two tiny bits of black fondant into a teardrop with a pointy top. 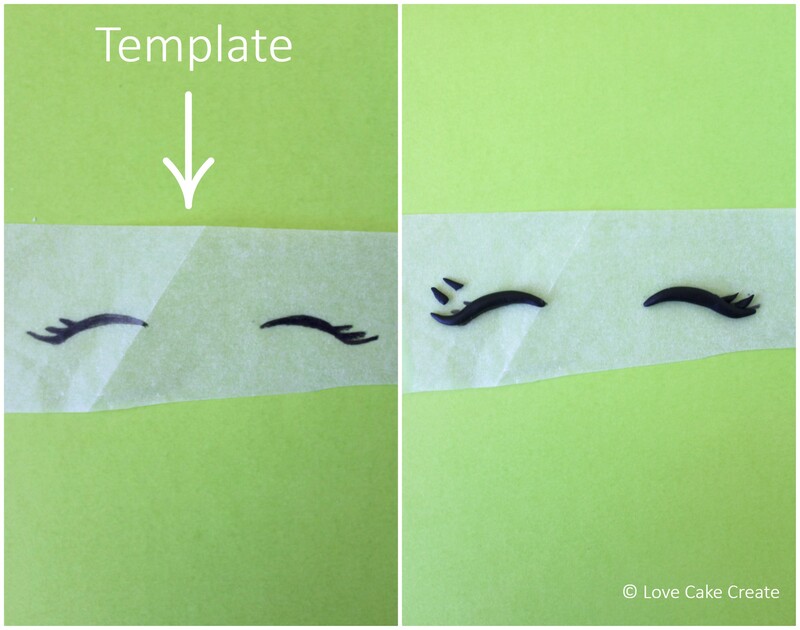 Use some sugar glue to attach those two teardrops to the top of the outer lashes. There’s no right or wrong here when pulling all the elements together. I found that by adding the ears first, I could work out where I wanted the rest of the facial features to go. To add the ears, first position them on top of the cake to work out where they look best. Ensure you have enough space between them so they don’t overlap and enough room at the front to add the flowers. 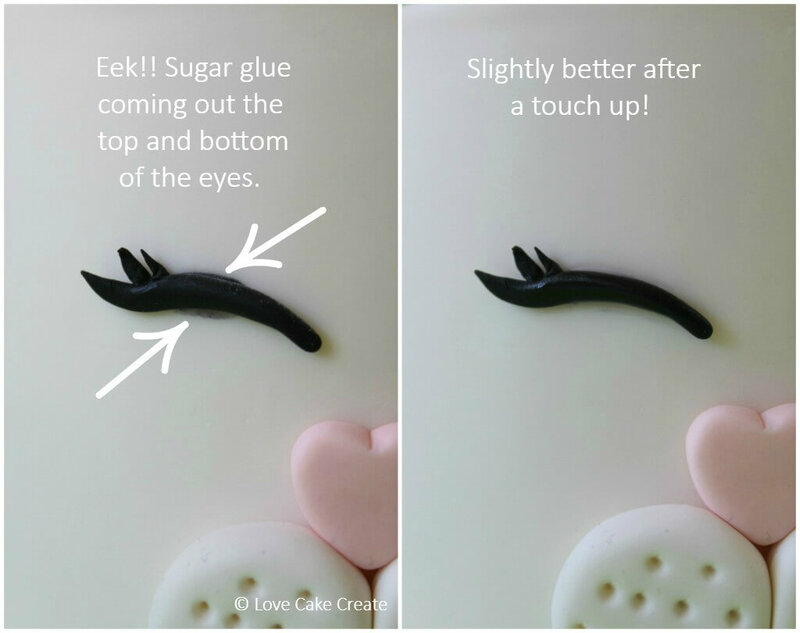 Add a dab of sugar glue at the base of the ears and when you’re happy with their position, insert them into the cake. Add a small amount of sugar glue to the back of the bunny mouth and nose and attach them to the face. Gah! Not ideal when you have black decorations going on a white cake. It’s not a total disaster though – to tidy it up a little, I used a flat paintbrush dipped in Vodka (remove any excess in a paper towel) and used small brushstrokes to wipe away the black smudges. It wasn’t perfect, but much better than before. Take some of the flowers, add a dab of sugar glue to the back of them and arrange them at the front of the ears. Now that all the elements have been assembled, you can stand back and admire your sweet bunny cake creation, just in time for a fun Easter party! What sort of things do you like to make at Easter? 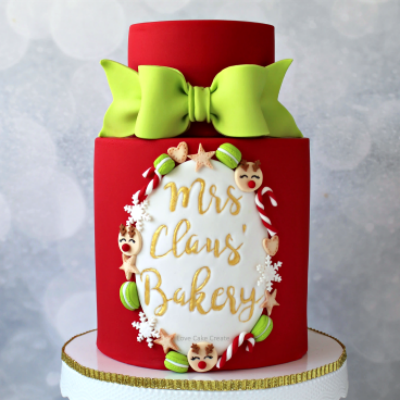 Do you enjoy making fun treats and cakes at this time of year? I’d love to hear your thoughts and feedback on the cake in the comments below. If you enjoyed this How to make an Easter Bunny cake, don’t forget to PIN it! Lovely cake for Easter. I was wondering what to make for Easter Sunday Afternoon tea with my family and this fits the bill perfectly. Not too complicated but still nice enough for a family gathering. I think it appeals to adults and children alike. Well I’ve just turned my oven on and greased my pans so I had better get my sponges baked, ready to decorate tomorrow! OMG that is ADORABLE! You have a serious talent!! Thanks so much Chelsea, the cake was much easier to make than it looks! This is adorable! My sister-in-law loves bunnies and would be all over this! Thank you Savannah! Easter is such a fun time of the year to decorate! 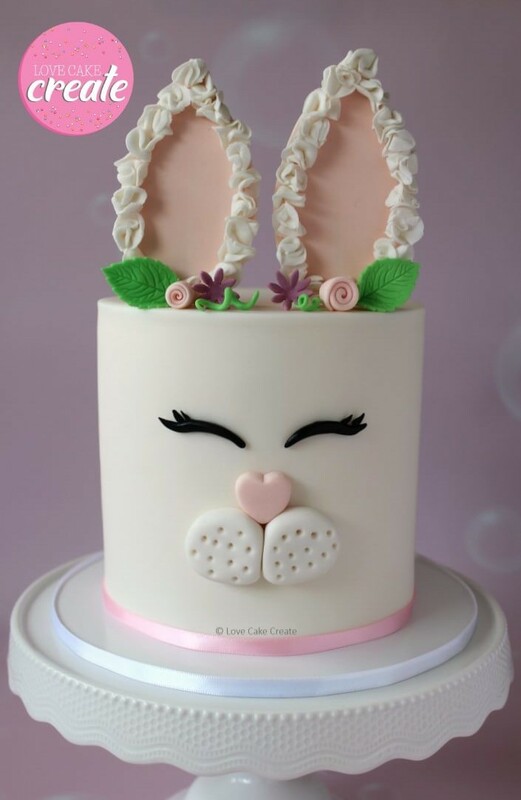 Love the clean look of this Easter bunny cake. I am in no way an expert like you are so mine may not turn out as great looking as your. Practice makes perfect. Thanks Candy, I love making clean, neat designs and that definitely takes practice! 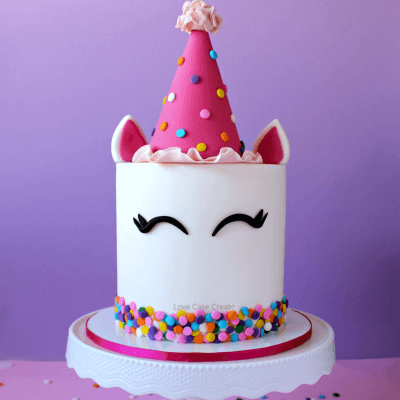 OK, this is seriously the cutest cake ever and a breath of fresh air amidst all of the unicorn cakes I keep seeing. How perfect for Easter! I do love treats during Easter and this cake looks wonderful and so fun to make. The details are amazing. Thanks for sharing and Happy Easter Weekend! This is so pretty and has so many delicate details. I’m glad you think so Rachel, thank you! This is so freakin’ adorable! You are talented!! I appreciate that Julie, thank you!! 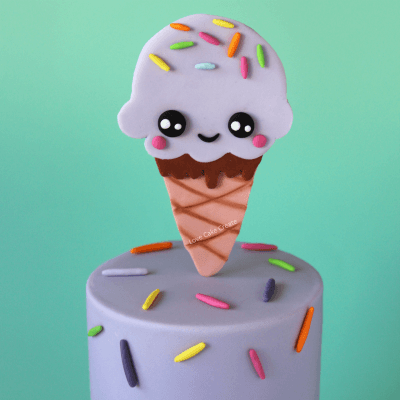 Ok, this is officially the cutest cake I have ever seen. So fantastic for Easter! Wow! You are so crazy talented! What a gorgeous cake! I have no idea how you had the patience to do this. It’s incredible!!! Talk about Pinterest win! Thanks so much Kate, glad you like it!! You have outdone yourself! So gorgeous! Thank you Susan!! You can’t go past a cute little bunny cake! OMG my daughter would love this. not sure I am brave enough to try it. I thought I’d compliment you on the high quality of your photos. they look really good. Thank you Alicia, I promise the cake is much easier to make than it looks. I appreciate your feedback on the photos too!! Omg STOP! This is so cute!! I have always wanted to make cute cakes like this. You made it look and sound so easy, but I feel like mine would end up being a disaster. I’m excited to keep up with you site and see more of your creations! Thanks Princy, glad you like it!